Shortening of telomeres, the protective structures at the ends of eukaryotic chromosomes, is associated with age-related pathologies. Telomere length is influenced by DNA integrity and DNA and histone methylation. Folate plays a role in providing precursors for nucleotides and methyl groups for methylation reactions and has the potential to influence telomere length. We determined the association between leukocyte telomere length and long-term plasma folate status (mean of 4 years) in Framingham Offspring Study (n = 1,044, females = 52.1 %, mean age 59 years) using data from samples collected before and after folic acid fortification. Leukocyte telomere length was determined by Southern analysis and fasting plasma folate concentration using microbiological assay. There was no significant positive association between long-term plasma folate and leukocyte telomere length among the Framingham Offspring Study participants perhaps due to their adequate folate status. 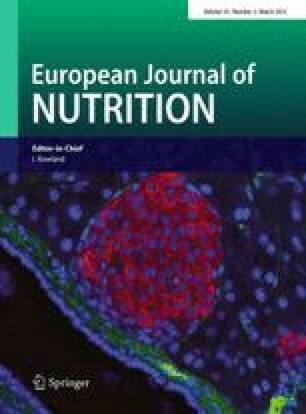 While the leukocyte telomere length in the second quintile of plasma folate was longer than that in the first quintile, the difference was not statistically significant. The leukocyte telomere length of the individuals in the fifth quintile of plasma folate was shorter than that of those in the second quintile by 180 bp (P < 0.01). There was a linear decrease in leukocyte telomere length with higher plasma folate concentrations in the upper four quintiles of plasma folate (P for trend = 0.001). Multivitamin use was associated with shorter telomeres in this cohort (P = 0.015). High plasma folate status possibly resulting from high folic acid intake may interfere with the role of folate in maintaining telomere integrity. The online version of this article (doi: 10.1007/s00394-014-0704-1) contains supplementary material, which is available to authorized users. Support from United States Department of Agriculture Cooperative Agreement 51520-008-04S, National Heart Lung and Blood Institute, Framingham Heart Study (NHLBI/NIH Contract #N01-HC-25195) and Boston University School of Medicine. Any opinions, findings, conclusion or recommendations expressed in this publication are those of the authors and do not necessarily reflect the view of the United States Department of Agriculture.